North Carolina: Esse quam videri. I guess the whole point of "South of the Border" is that it is so much better than or distinct from whatever is north of the border. The border, in this case, is the line demarcating the states of North Carolina and South Carolina. South of the border, in this case, is South of the Border, the most quintessential example of Roadside Americana if ever there was one. South of the Border ends at the state line, which is right about where US-301 goes under I-95. There are opposing North Carolina and South Carolina signs on I-95 but both are on that overpass making them inaccessible. This sign is on US-301 just past I-95. Whereas south of the interchange lies the Mecca of tourist traps, northward US-301 just seems to fade into nothingness. 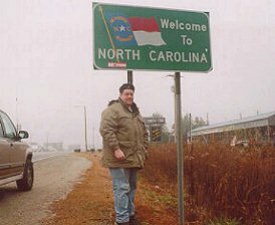 The skies hung low over me as I traversed the Tar Heel state, so named for North Carolinian soldiers who would not turn tail and run during battle, much like as if their heels were glued to the ground with tar. I battled overcast skies and light drizzle from when I left Georgia early that day; the sun did not part the clouds until I was well into Virginia. This picture was taken just after 12 noon. I-95 through most of North Carolina started to remind me of home as I returned from the southeastern region of the country. As I have always lived in the New York City suburbs, naturally I am used to seeing vast expanses of sprawl on either side of the right-of-way. Most of the interstates in Mississippi, Georgia, and South Carolina were lonely stretches of asphalt and concrete stretching to the horizon and over the fields of memory, beset by endless deciduous foliage, the monotony interrupted only by the occasional weigh station or exit ramp. Once I started getting around Asheville the backdrop of residential and light commercial structures on or adjacent to the frontage roads became more and more consistent. After two long weeks on the road, the only times I bypassed vast suburban areas were in locations such as Dallas and Oklahoma City, population centers situated on flat, featureless terrain; to see sprawl over the familiar eastern landscape with denser tree growth and a more varied topography was my first visual manifestation that the end of my journey was fast approaching. As I look back on this picture, I recall what Johnny Carson said as he began the last segment of his final show back in 1992: "So it all comes down to this." Well, not exactly. With this photo my quest is not complete; I still have 44 of 100 pictures left to take in 24 states, and 13 states in which I have never set foot. So what do I mean? Probably the busiest road trip in terms of this quest was my trip to Dallas. I took 26 pictures along the way in 15 states (including one retake in Maryland). I cannot anticipate taking a single more-productive road trip. 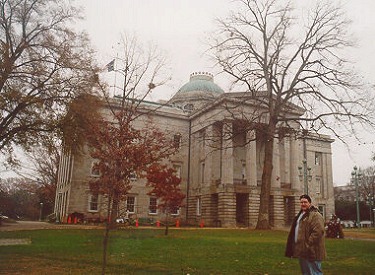 This picture, taken in Raleigh, North Carolina, was the last photo to take on this trip. Once this photo was safely in my camera awaiting development, my quest responsibilities for this trip were complete. After driving more than one thousand miles out of the way to hit Richmond, Oklahoma City, Austin, Tallahassee, et al, I could put my camera away and concentrate on getting back home. The return trip from Dallas was much longer than the journey down, and disappointment at having come away from the Baseball Winter Meetings without a new job title only contributed to my wanting to get the whole trip overwith. The whole idea of going out of the way was to help complete the Project. In a larger sense, the quest represents something in me, and something in all of us: An idea, a plan, a mission that we consider interesting, worthwhile, and important to us. My mother wanted me to fly down to Dallas, but I had resolved months and months before to drive, and to plan a route that would afford me the most quest-related photo ops. Why? Because I wanted to do it. Nothing more, nothing less. This picture of the North Carolina State Capitol proves to me that I can accomplish something that is important to me even though it might seem trivial to someone else. There's a lesson in there somewhere for all of us. If you have a quest of your own in mind, or thought about visiting someplace to which you've never been before, remember this. Just pick up and do it! Upon your return you'll feel a sense of accomplishment. Now back to the show. Raleigh is a compact little city. North Carolina's State Capitol is fairly small, along the lines of the capitols in Concord and Montpelier; but especially more so considering that 76% of U.S. states are less populous than North Carolina. The grounds sit on one city block, about 550 feet on each side. Architecturally speaking, the statehouse is considered "cruciform," meaning four perpendicular wings connected by a rotunda. Though in this case, they are probably wings in name only given the relatively tiny dimensions of the building. The capitol was built in 1840. The dome is distinctive, and a rendition of it appears on road signs throughout the city. This page loaded in 2.468 milliseconds.